Recently we have been discussing how the economic recovery — mainly jobs — has reached all corners of the state, albeit to varying degrees. The state as a whole is approaching full employment. Given that the business cycle isn’t dead, we are also starting to see progress made on deeper measures of economic well-being, households incomes in particular. The most significant progress to date is in the Portland metro area, largely due to that’s where the economic recovery took hold first and the region has seen the best gains to date. However, progress in terms of median household incomes, poverty rates, caseloads and the like have yet to really improve outside of the broader Willamette Valley. This was something that was really brought to my attention a few weeks back at a presentation and discussion I was having with an umbrella group that oversees various low-income housing organizations, food banks and similar programs from across the state. Their message to me was that they are not seeing real improvements among their clients or even in some of their local communities. And you know what? They’re right. 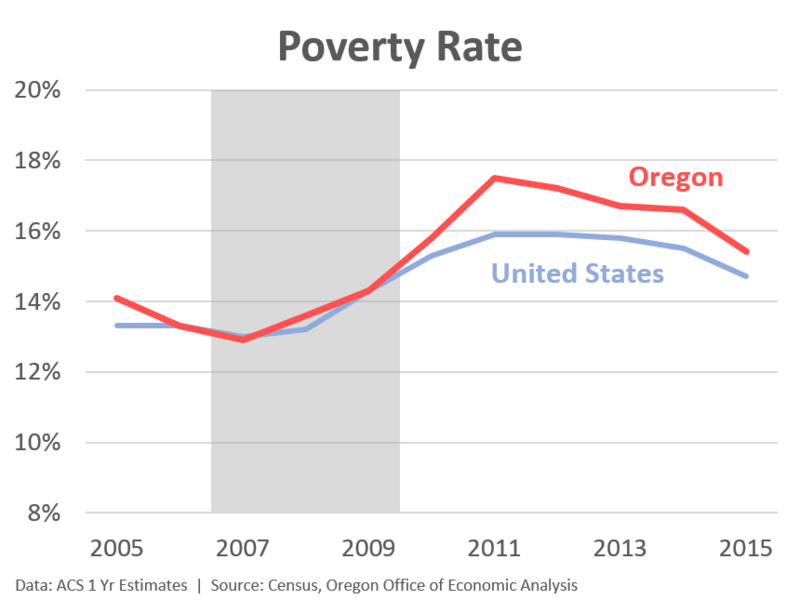 I knew that Oregon’s poverty rate is essentially halfway back to where it was prior to the Great Recession and that Portland’s was three-quarters of the way back. I knew that meant the rest of the state had seen smaller improvements but I had not done the actual math to show how much (or little) progress had actually been made. It turns out to be very little. The Small Area Income and Poverty Estimates (SAIPE) data for 2015 is not released yet — it will be in December — but I am using the ACS data as a guide. 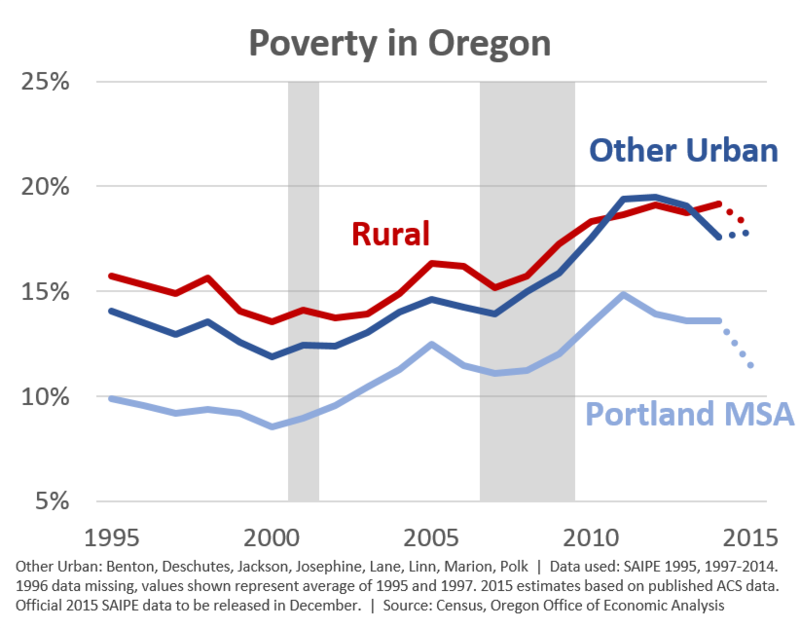 It does appear that in 2015, rural Oregon saw its’ first real tick down in poverty. Obviously that’s good news, even as poverty remains considerably higher than before the recession. Other urban areas in Oregon have seen some progress to date but it appears that it will show no real improvements in 2015. This is a combination of continued improvements in the Willamette Valley but no further improvements or even increases in the Rogue Valley and Bend. To be sure, many challenges remain, particularly when it comes to poverty, caseloads and the like in areas that have struggled economically. Job growth alone is a necessary, but not sufficient condition to lower poverty. It needs to be combined with a tight labor market and strong wage gains. Our office’s position is that the differences seen across the regions of the state largely has to do with the timing of the local business cycle. It wasn’t until 2015 that poverty really dropped in the Portland MSA. Given the recovery took a couple extra years before reaching the rest of the state, such improvements are still to come. Given all that we know about 2016 so far, in terms of jobs and wages, the data will show further improvements when it is released a year from now. But it might not be until 2017, or even 2018, before poverty outside the Willamette Valley really improves. Certainly that sounds discouraging, however as we talked about previously, there is a natural ordering of events over the business cycle. We are now at the point where these improvements in broader measures of economic well-being are actually here and not just the theoretical next step. The biggest issue in terms of actually seeing these gains is the timing of the next recession. Can the current expansion last long enough before the cycle starts again? Tomorrow I will highlight some of these trends for Josephine County (Grants Pass MSA) where economic growth has returned, incomes are just now starting to rise but poverty has yet to improve.